Hey, remember the supor stock pot that Luxury Haven give away? Well, i must confess, i'm the lucky winner. :D This time round, Blackswan of Luxury haven have another great giveaway. 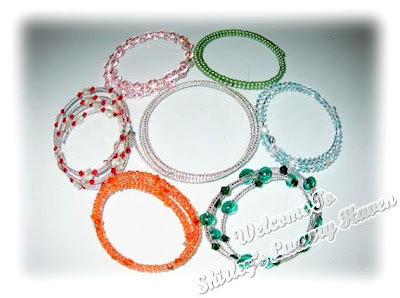 Look at these beaded bangles, aren't they lovely? Well these are all handmade by Blackswan 82 years old mother. And Blackswan is so generous and willing to share these bangles with 7 lucky readers of her blog. Care to participate? Well, here's the link : http://luxuryhaven.blogspot.com/2011/04/mothers-day-handmade-accessories.html Follow the instruction there and who knows, you could be one of the 7 lucky winners. And hopefully i could be second time lucky too. But the difficult part is - which should i choose? All these bangles are just too lovely to resist. Imagine having all the 7 and match each and everyone with a different color outfit. Oh, wonderful! *wink wink* Haha! well, i can't be too greedy, i can only choose 1 but i do have a 1st and 2nd choice. Visit luxury haven's mother's day handmade accessories, click on the comment and see what's my choice. Thks for sharing the Giveaway & the many efforts, dear! Lovely post!